Ranger Frankie Mewborn guides visitors on a tour of the New Echota Historic Site in Gordon County, which preserves what is left of the Cherokee capital. In 1835 Cherokee leaders signed the Treaty of New Echota requiring the Cherokees to leave the southeast. 1. Why did the Cherokees create their own nation and capital? 2. In what ways could parts of New Echota be more more like a white man’s town than a typical Native American community? 3. Explain the circumstances around the signing of the Treaty of New Echota. Why was it signed? Include the personalities involved and their part in the signing. 5. The Creek and Cherokee approaches to dealing with the white settlers were very different. Examine the results of both. Why would one be better than the other? 1. After seeing the examples in the video of Cherokee lifestyles, discuss why their plan to assimilate into the white culture was not enough. Was there anything the Cherokee could have done that would have satisfied white Georgians and allowed them to remain in Georgia? 2. 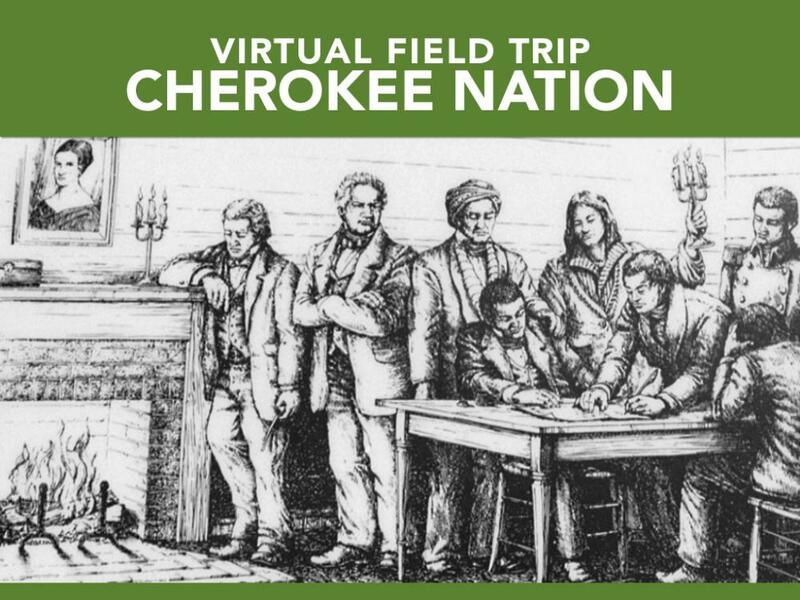 Following the video, an in-person visit or using GPB's virtual field trip to New Echota, break into groups and in your group, come up with a plan that would have been acceptable to both the Cherokees and the white settlers that would have allowed the Cherokee to stay in Georgia rather than move to Oklahoma. Write this out as a plan that is easy to understand and explain. Each group should explain in this plan all the reasons it would work. Discuss these plans as a class. Using either a class vote or a debate system, decide which plan would be acceptable to both the Cherokees and the white man. They thought that if they lived as the white man lived (assimilated with the white culture) and had a government like the white man, they would be allowed to stay on their own land. Other Native Americans had been forced off their land. The Cherokees did not want that to happen to them. There were 30-40 permanent buildings including log cabins with furnishings just like the settlers: fireplaces, dishes brought from Europe, beds, looms for making cloth, etc. There was a combination hotel/tavern/general store which sold items typically used by the white man. The Cherokee had a parallel culture living much like the typical settlers of the 1820’s and 1830’s. 3. Why was the Treaty of New Echota signed? Include the personalities involved and their part in the signing. The Treaty of New Echota was signed in 1835. John Ridge, who spoke against the removal of the Cherokees from their land, feared for the lives of the Cherokee people. He signed the Treaty to keep the Cherokees from going to war with the white man. Because the Cherokees were angry about his signing the Treaty without the consent of all the Cherokees, he was killed three years later. By 1838, most of the Cherokees were driven to Oklahoma. By 1890, New Echota ceased to exist. The answer to this question might already be unfolding in your community. If you feel comfortable discussing this with your students, this is a good opportunity. We can look back in our history and how we treated those we did not trust: Native Americans, Japanese, African Americans, Germans, etc. We are ashamed (at least most people are ashamed) of the way these people were treated. This question asks: Do we still discriminate against people who are not like us? If they want to assimilate and be like us, do we welcome them? Looking back at the results of our treatment of others in the past might help us. Do we want history to repeat itself? Then discuss the results: both had to give up their land. In both cases, someone got some money for the land – but not the entire tribe. That is why some were killed by their own people (Elias Boudinot, Major Ridge, Chief William McIntosh). The site at New Echota has been re-built and preserved on the original Cherokee land. The mounds are the only things that remain of the Creek culture (Ocmulgee and Kolomoki) and those are not as recent as New Echota. The Creek Indians have been scattered. The Cherokee have rebuilt their capital city in Cherokee, NC from the remnants of those who hid and stayed behind during the Trail of Tears and those who walked back or came from South Carolina. They are still trying to keep their culture alive.